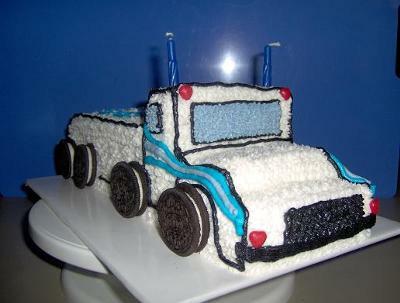 For this truck cake, I used a yellow cake mix and baked according to directions in a 9" x 13" pan. Let cake cool completely. Be sure to level the cake! Then cut in half lengthwise. Place one half of cake on your serving board and ice the top. I used buttercream icing. Take the other half of the cake and cut about 3 or 4 inches off. Save that piece! Place the long piece on top of the 1st one. Then with your 3-4 inch piece, cut approx. a 1" wide strip the whole length, this goes on the very top of the truck. Trim so it is 1" all the way around. Secure it with icing as well. Now, take what's left and use a very sharp knife and slice the thickness in half. This is the hood of the truck. I shaped mine to be slightly rounded. Put the hood in place and begin covering your cake with a star tip in what ever color you like. I used oreo cookies for the wheels and red hots for the brake lights. I used a round tip for the outlines. And a large round tip to make the stripes around the doors. And for the finishing touch I put candles for the smoke stacks. Kelly, I do not give you more stars because 5 is only the limit. You have talent. You'll do a great job, you always do!